I am always noticed some questions on Quora, something about sleep more feel tired .Why i am tried when sleep less , but i am much more tried when i sleep more , many people are puzzled at this issue . Actually when you feel tired , it means that your sleep quality is not good enough . Tired or energetic depend on the sleep quality . 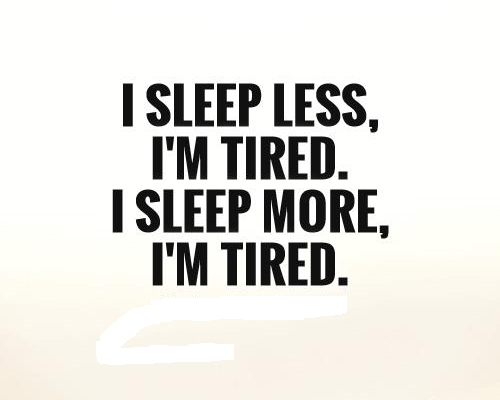 For example , i just sleep about 6 hours , but i am always energetic all the day , sometimes ,before the weekend ,i will stay up to watch TV and sleep at 2 am or later, finally i get up in the morning maybe about 10am or later , in fact , i was really so tried compared just sleep 6 hours every day . One third of a person’s life is spent in sleep. Therefore, it is very important for us to have a good sleep. The quality of sleep is reflected not only in the face but also in the physical state. During the daytime in life, we basically don’t mention what we’ve done outside. After a long day of exhaustion, we sleep at night and it’s time to relax and rest on the most recent day. It’s time to sleep and be the best in the body. And rest mode. However, enough time to sleep enough, but many people still feel tired and fatigue the next day, can not afford the spirit. So what’s going on with sleep and tiredness? Why you feel more tired after sleeping longer than usual? 1.Full of meals to eat before going to bed, gastrointestinal to intensify digestion, stomach filled with food will continue to stimulate the brain, the brain has excitement, people can not sleep safely. As Chinese medicine says: If the stomach is not getting along well, then you are uneasy. 2.The pillow is too low or too high. From the physiological point of view, the height of the pillow is 8-12 cm. Too low a pillow can easily cause stiff neck or excessive blood flow to the brain, which causes the brain to become drowsy and swollen eyelids the next day. Excessive pillows can affect the respiratory tract and are easy to snoring. In the long run, it can easily cause neck discomfort and affect the quality of sleep. 3.When sleeping with both hands under the head, in addition to affecting blood circulation, causing upper limb numbness and soreness, but also easy to make intra-abdominal pressure rise, over time will also produce reflux esophagitis. 4.When you are cold, many people like to sleep with your quilt covered. As everyone knows, it is easy to mask and cause difficulty in breathing. As the carbon dioxide concentration in the quilt rises, the oxygen concentration continues to drop, and the humid air is inhaled for a long time, which is extremely harmful to the brain. A long time will lead to lack of oxygen, resulting in poor sleep and easy nightmares. When you wake up, you will feel dizzy, weak, and apathetic. 5.Oversleeping, some people like to stay up late to make up, but the adverse consequences of biological clock disorders can not be avoided, so that even if you stay up late to sleep for 10 hours, wake up will feel sleepy, lack of energy . If you also have issues we mentioned above , maybe you have to avoid it in future . You also can visit our page to know more about our Pegasi Sleep Glasses, black technology about blue light ,maybe it is helpful to you .